Wednesday – An Aspirational item. Something you aspire to getting around to using or trying one day. I have held on to this embroidery thread because I have used it off and on at different times over the years. In an effort to continue to condense my craft clutter this is one of the things that didn’t make the cut this time. In the unlikely event that I will take up cross stitch again I will just have to buy new thread. In the meantime this lot is no longer going to waste. I am sure it will sell quickly at the thrift store. A good friend of mine was going through a very worrying time this weekend. The crisis is over now thank God. Now they can begin to strive for the best possible long term outcome. Wish them luck. I took care of some sentimental clutter last week and immediately took it to Goodwill. It is amazing that I haven’t felt any loss at all over having some things I held on to for decades being gone from my life. Our minds tend to exaggerate the value of things related to remembrance. Good for you Juhil. And I love your statement ~ Our minds tend to exaggerate the value of things related to remembrance. I am going to quote you one Facebook and twitter with that one. I just saw it on my Facebook page which was a fun surprise. Glad to bring a smile to your day. Oh my, I wish I shopped at your thrift store. You’ll have to fight Andrea for it, but I dare say it has already been snapped up at the thrift store by now. I can see that now. Embroidery really is a very inexpensive hobby considering the cost layout divided by the hours of enjoyment. And if you can design your own patterns it is even more so. I took a look at your craft blog and now I see why you want that thread. Cute cubs by the way. Do you sell your work? Funny you should mention it but I’m thinking of selling the cubs when I finish it. I did one similar of a tiger with storm clouds and I framed that and its in my loungeroom on an easel. Looks great. People think its a painting and don’t realise its cross stitched…I’m not sure if I will be able to sell the cubs and I’m not sure if I will but I’ll see when the time comes! Yes framing can be so expensive. It is just as well that they take a long time to do then or you would run out of walls to put them all if you don’t sell them. Selling them would seem like slave labour though because you put so many hours into them but can only ask so much in return. It would feel like you had worked for about 2c an hour. I always thought that, too. When I think of the hours I put into them, I never thought anyone would be willing to pay what it would be worth. Almost all of mine have been gifts for people I knew would particularly enjoy them. I have so much more fun making them FOR someone than making them for myself. Crafting is one of those tricky things when it comes to clutter. I often think people enjoy making things so much that they only think others enjoy receiving their creations. I have several knitted items that my mother made for me but I really don’t wear so it is about time I sent them to the thrift store. I am sure also that I have given things I have made as gifts that I only think the recipient loved. People are always polite about these sorts of things so it is often hard to know the difference between genuine enthusiasm and polite acceptance. Great idea giving your floss to the thrift store. 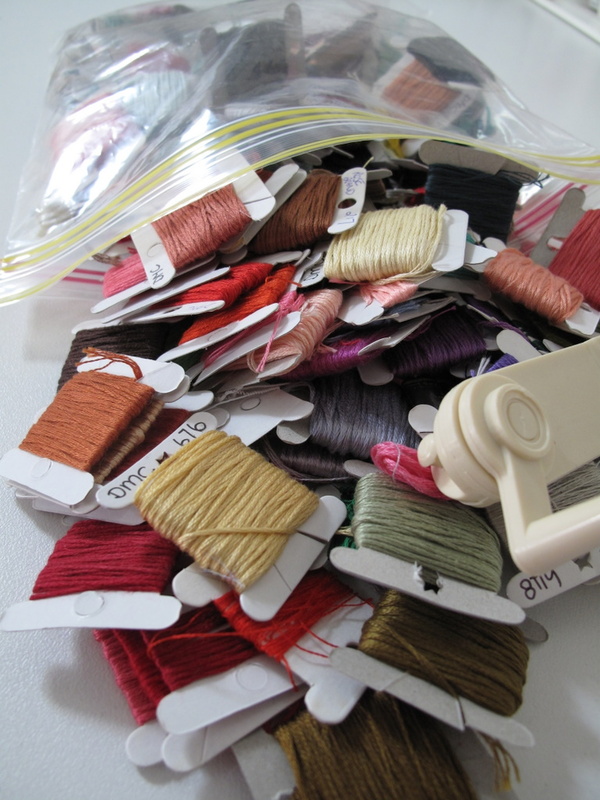 Many people don’t realize it, but floss and sewing thread “age” and become brittle over time–rendering it useless! Better to send it out into the universe for someone else to use and pick up new if you need it! That’s what I thought Deb, only I probably should have done it sooner. But better late than never hey? Good luck to your friend. I have said a prayer for them. I helped a friend with decluttering this weekend, and now I am charged up for some of my own. Aspirational clutter, here I come! Sabine, I was the friend, and I very much appreciate your prayers. The crisis was resolved, I believe, by the grace of God. Cindy- I am so glad the crisis is passed. Enjoyed your post this morning (Wednesday), about supposed sentimentality. Thank you Sabine and also how nice of you to help your friend. Sharing the declutter love, good for you! Love this post. I got rid of my embroidery thread a few months ago. It was hard to let it go, but no regrets. I’ve already tackled my aspiration clutter for the week. I’m getting rid of my copy of the complete works of Shakespeare. Yes, I’ve meant to read that oversized book for years, but it hasn’t happened. My husband agreed to get rid of a large book of his if I would get rid of that one. He’s completely on board now with decluttering. Yesterday, I asked him what he was doing out in our storage room, and he said he was looking for something to get rid of. Yay! Lucky you Anita, having your hubby on board with the declutter thing is a great help. My hubby is also keen and like me the longer this mission goes on the more ruthless he becomes. I love it. One thing about Shakespeare, it will always be available should you change your mind. 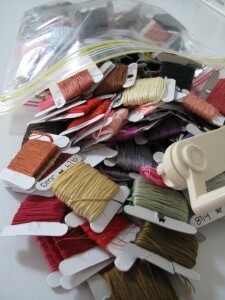 Ok, I’m going to declutter my embroidery thread, too. It’s so old I don’t remember the last time I used it. I usually pull off a strand to mend clothing, but the colors are really bright, and I don’t wear bright colored clothing. I’m not sure why I still have it. I think I’ll save it for Friday-lazy clutter item. I definitely don’t aspire to do embroidery. Good for you Delona. Get that thread out of there if you aren’t using it. Someone will love to take it off your hands. It always amuses me when I write a post but it is my declutter item that generates most of the responses. If it gets people decluttering that is great. I, too, share your “something I am grateful for today.” Thank you for thinking of us all along the way. That’s what friends are for Cindy. My thoughts are still with you all. I am doing your mini-missions again this week and have thrown out an Argos catalogue for my ‘guilt’ item, as I felt guilty at having it when I can look things up on the net. Now Christmas has gone I don’t need it so it’s gone. One thing I think makes your site so successful is that it’s great to have a theme and instructions for decluttering, to get us going. Anything will do, just to provide a focus, a place to start. This has been very useful for me as I have a lot of stuff, so thank you. I am glad the mini mission format is working for you. The missions do get you thinking about what kind of clutter you have. Quite often when I point out an area or a clutter category it brings the focus on to more than one area/item in that theme and my readers end up decluttering more than they expected. If one thing decluttered is good half a dozen is even better, right?